Unusual Features: Kriar being a vegetative (rather than mammalian) humanoid race possess several plant-like attributes. Their skin is photosynthetic, and they derive nourishment from light. Their tissue is dense (like wood) and thus they are heavier and more resistant to injury. Kriar scientists have heavily modified the heriditary physiology of the species and many of the evolutionary drawbacks of their origins have been engineered away. Most Kriar rely on a life-support mechanism called a matrix stone that is embedded in their bodies at a young age. These jewels provide supplemental photosynthetic nourishment so the Kriar can function for extended periods in environments where there is little to no natural sun-light. These jewels are normally installed in sets. A focus stone in the forehead, a distribution matrix enfleshed in the collarbone, and brain-stone or central control enfleshed beneath the lower abdominal muscles. These matrixes often have cybernetic enhancements and convenience mechanisms built into them depending on the kind of work the Kriar does. 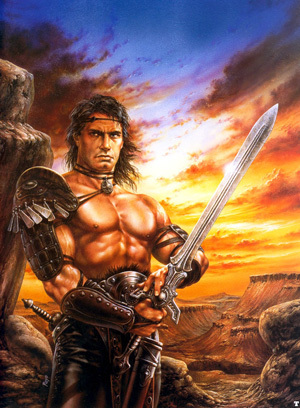 Warriors typically have additional implants in the palms of both hands. These are high-energy foci. The hand focus allows the warrior to create force weapons and shielding, along with usually having various sensor and cybernetic apparatus built into them. Magical Skills: None. Kriar possess many technologies of such sophistication that they might be indistinguishable from magic. Tournament Rank: Ivral does not engage in tournament play. However, as a front line warrior in the Kriar military she has had intensive military combat training and experience spanning dozens of millennia. In addition, her body is "combat augmented" resulting in increased reflexes, strength, and resistance to injury. Summed together there are few creatures aside from the Eternals and elder elite who can challenge a Kriar warrior in direct combat. Information: Ivral Techstar is the youngest of the Kriar at (only 156,000 years old). Like the rest of her people she was cursed with infertility and sense deprivation by the Jyril. Complex genetic locks prevented the Kriar from cloning or engineering away the reproductive and sensory disorder. To ensure race survival Kriar extended their lives until a normal reproductive and evolutionary cycle could begin again. In early 1078 N.I.S Cassandra Kel'Ishtauri Felspar cured the Kriar genelock using the power of Eternity. Ivral Techstar had previously come in contact with Cassandra because she had been seeking the Kriar's help in apprehending a rogue Kriar warrior (and political leader) named Daergon Surr. Also during that time Cassandra was still adjusting to the Kriar power matrixes that she had acquired during the quest against Hellzan. The stones had been "healing" her-- the end result being a slow metamorphosis to Kriar physiology. Through Ivral, Cassandra learned about the Jyril curse. She eventually decided to assist the race in reclaiming their normal evolution. A year later she did succeed and became an instant hero amongst the Kriar people. The Kriar government however was wary of Cassandra, this (to them) virtual infant had overcome in a single year what they had spent a thousand millennia trying to defeat. It was decided that a guardian should be assigned to the mage. Ivral being the youngest Kriar, and already knowing Cassandra, was selected to be that liason. It was decided that "adoption" was the best way to give Cassandra legal citizenship on Homeworld and further assist in the Kriar hierarchy in keeping track of this powerful mage. Though initially the adoption was a matter of convenience, Ivral eventually came to know and care for Cassandra. After many millennia of being unable to reproduce, the Kriar psyche is rather preoccupied with procreation and child-rearing. To someone a thousand millennia old, Cassandra is still a child. Ivral by stages became in function as well as name-- Cassandra's mother. Dame Techstar (Ivral's birthmother), eventually became infatuated with her grand-child mostly because of Cassandra's daughters (Cassin and Annawen) who were children (in human terms) and born Kriar. The Techstar family has profited enormously by Cassandra's addition to their ranks, as the mage's "star status" among Kriar is worth a great deal in favors, media deals, and other "celebrity status" benefits. This, of course, certainly hasn't hurt Cassandra's popularity among the members of her adoptive family. Unusual Features: Aside from her size, Damrosil has become spiritually and physically bound to the Shaladen blade Cybersong. Years of exposure to augmentation energies has gradually increased the density of her body. Without utilizing the Shaladen power she can easily lift around 1000 pounds. Because of her being bound to the Shaladen Damrosil is effectively immune to the effects of aging. As a result of Cybersong's special augmentations, Damrosil is completely unaffected by heat up to 650 degrees farenheit. Group Affiliations: Protectorate Enforcement, Jhandris'Kul clan of Myrmigynes, House Felspar, Court of Isis. Magical Skills: Damrosil is trained as a war mage specializing primarily in attack magic. She generally disdains the use of magic and her skills are not on par with a mage of equivalent experience. She has very little magical research experience and delves little into archana. Damrosil's battle magic has the effectiveness of Arch-magi. Tournament Rank: [DS] All-World's Tournament of 1089, winner 14th circle, All-World's Tournament of 1093, winner 15th circle, placed in top 10 of unlimited play in 5 entered tournaments. Damrosil is a veteran tournament warrior with over 312 victories at various ranks. She spent some years in the Arcturan Death Spectacles and has trained extensively with Beia Targallae. Beia and Damrosil often compete in tag-team unlimited class tournament play. When together they have never failed to place below the top 10. Information: Damrosil is a 2nd generation member of the Band of the Crescent Moon. 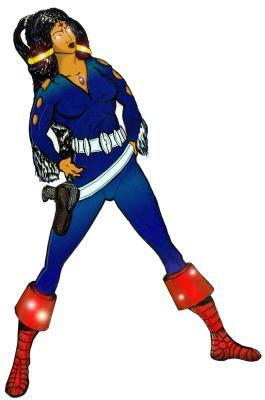 She has freebooted across many planets and participated in numerous adventures. Damrosil was a longtime companion of Tiernia Nirvanae and the two of them had numerous encounters with the Dream Merchants and their operatives. Damrosil and Tiernia grew apart in their later years as Tiernia settled down to build a bard school. Damrosil went on to fight in the Arcturan Death Spectacles and made the acquaintance of Beia Targallae. Damrosil escaped the arena and shortly thereafter assumed leadership of the Jhandris'Kul clan of Myrigynes. Several years later, Beia also escaped the spectacles and returned to her home among the clans. Itching to begin adventuring again, Damrosil willingly stepped down from her seat as queen and gave the position to Beia. It was shortly after this period that the Eternal Yi began the reformation of the Protectorate with the help of Cassandra Kel'Ishtauri Felspar. By that time, Damrosil had already found the Shaladen blade Cybersong. Since Damrosil had already bonded with the weapon, and few better warriors existed, the protectorate asked her to join their ranks. Damrosil accepted. Damrosil has the distinction of being the first of the indoctrinated warriors of the Shael Dal. Unusual Features: Corim has a row of circular scars across his chest put there by a run-in with a green dragon. Magical Skills: Corim does not himself have any magical skills. However, in the events following Shaladen Chronicles: A Knot in Time, Corim's soul becomes intertwined with the spirit and intellect of Aarlen Frielos, the Ice Falcon-- one of the most powerful mages in the Realms. This mind-spirit-share grants him significant magical powers that are at least half those of the original Aarlen. Unfortunately, tapping into those abilities is somewhat complicated and 'icky' as Corim describes it. Also, when he does it-- Aarlen can 'feel' him do it. The big scary Territaani tyrant lady doesn't LIKE it. So, only in extremis does he tap into that knowledge. Aside from the magic he knows through his association with the Ice Falcon. Corim is an extremely well read sage, and familiar with a great number of magical phenomena. His knowledge of such things is only the broad strokes, and his awareness rarely benefits him beyond knowing whether something is potentially dangerous. Corim also possesses a pseudo-magical (psionic?) talent called metapathy which allows him to project emotions (and sensory) into others. To a certain degree it also allows him to specifically mirror or sense the emotional state of another person. When Corim first developed this power he was "inverting" the emotions of others-- projecting the opposite emotion of what people were currently feeling; calm people became angry, despairing people become ardent, etc. Later, Corim gained a measure of control and it doesn't work without his knowledge. Tournament Rank: Corim is exhibition warrior with 411 bouts of experience in the 'local talent' tournaments around the continent of Sharikaar. He has not (yet) participated in the All-Worlds events where the competition and talent are far more challenging. He has fought blooded Death Spectacle pit fighters. So, it's safe to assume at that time he would have held his own in the 10th circle. Corim trained extensively with Beia Targallae, so it can only be assumed his skills have improved. Corim is rather magic "poor" so, he will need more adventuring and experience before he could compete at the 12th and higher circles of All-world's competition. Information: Corim Vale, sometimes known as the "Fighting Sage". Is a wandering tournment competitor and professional treasure hunter. His tournament earnings and treasure hunting go to fund his studies and teaching endeavors. Corim embraces the way of Mataya, the philosophy of the Lore Knights, an order of "enlightened" warriors who follow a form chivalric code that involves the defense of the weak and spread of knowledge. Corim is a talented fighter, and a singular intellect. He speaks five languages (Common, Gray (Noble) Elvish, High (Common) Elvish, Dwarven, and Draconic), additionally he reads Silissian and Runes Arcanis (a common magical symbol language). Corim is always curious and full of questions. He is a "thinking" warrior and has no great love or instinct for battle. It is his smarts and determination, however, that have always won fights for him.